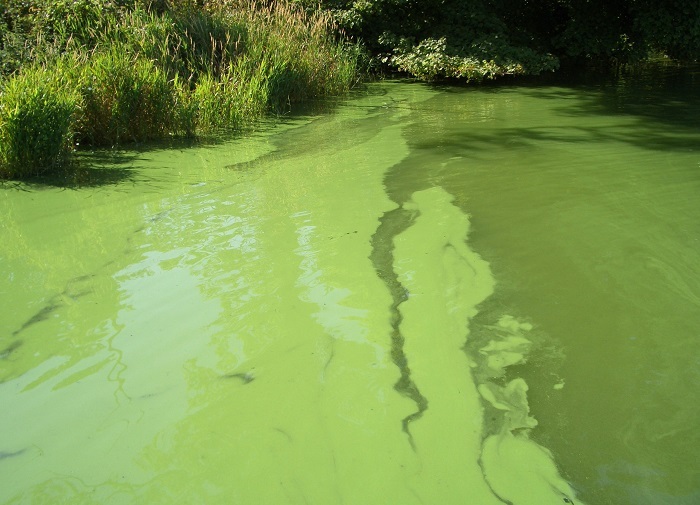 Citizen scientists across the UK are being urged to help the Centre for Ecology & Hydrology (CEH) monitor harmful algal blooms which can threaten public health as well as the lives of dogs, cattle, birds and fish. 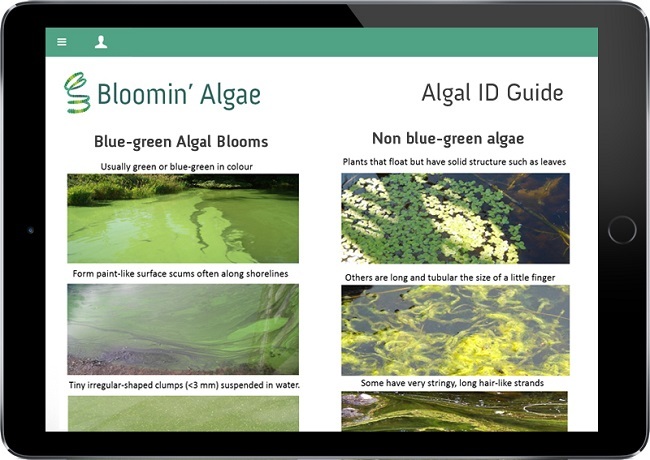 Dog walkers, swimmers, boaters, anglers and anyone else near fresh water can now record the presence of harmful algal blooms with a new app called "Bloomin' Algae". The app, which has been created in collaboration with the Environment Agency, Scottish Environment Protection Agency, Public Health England and Health Protection Scotland, enables users to submit a photo of the bloom and state what activity takes place at the location, so that the potential risks to people and animals can be gauged. Blue-green algae naturally occurs in lakes, ponds, canals, rivers and reservoirs around the world and are most commonly seen during the summer and early autumn. But they are a major health risk when they bloom, especially when the scums accumulate along the shore where children or dogs play, or where livestock come to drink. Professor Laurence Carvalho, a freshwater ecologist at CEH who specialises in the study of algal blooms and water quality, helped devise the app with a number of colleagues. Professor Carvalho said, "Algal blooms can be a major health hazard as they commonly produce potent toxins that can result in people experiencing skin rashes, eye irritations, fever, muscle pain and worse. They can also be a significant hazard to animals; dog owners and farmers need to ensure their pets or livestock do not drink from waters affected by blue-green algae." 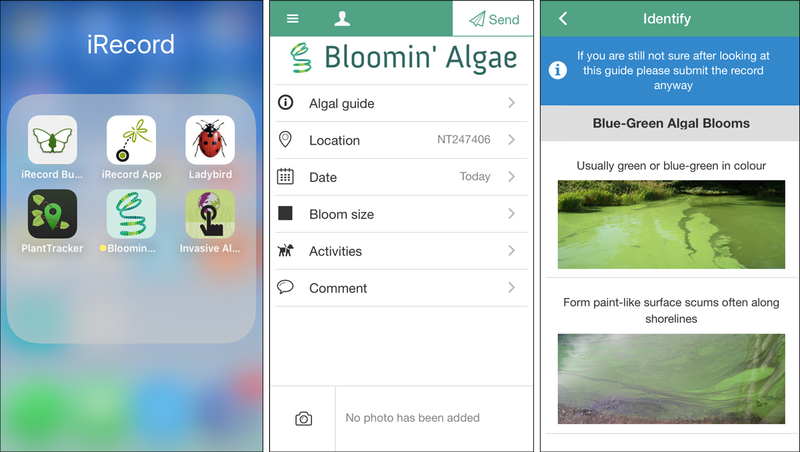 "People can download the app from Android and Apple app stores and if they then come across an algal bloom, they can use the app to send us a photo and details of its location. We will then alert UK environment and health agencies so they can take appropriate action." Blue-green algae are microscopic but clump together in visible colonies up to a few millimetres in size that can rise to the surface and form thin wispy green blooms or thick paint-like scums if the numbers are very large. All verified records can easily be viewed on the Bloomin' Algae interactive map. More information about iRecord, including details of how to register, can be found on the Biological Records Centre website. Where can I download Bloomin' Algae?